With the help of our experienced engineers, we are able to design and develop Optical Proximity Switches. Our range is manufactured using excellent quality copper so that it is in tandem with international quality standards. Clients can avail our range in various specifications at nominal prices. The Optical Proximity Switches are a reliable solution for automation where other Proximity Switches have limitations. These are Infra-red type sensors incorporating advanced and reliable technology. These switches have a distinct advantage of higher sensing distance over the Inductive and Capacitive type of switches. These can work more reliably in a noisy electromagnetic radiation environment. As an infra-red wavelength light source is used, it is immune to visible light interference. - Counting of bottles, Jars, Containers etc. - For security & safety in Machine Tools, Presses etc. PRINCIPLE OF OPERATION These switches incorporate an Infra-red transmitter & receiver device housed in a single enclosure or separate enclosures. The precision pulsed transmitter beam is interrupted or reflected by the object. The advanced electronic circuit generates an effective output signal when the object is sensed. Thru-Beam (TB) type switches have separate transmitter & receiver. The object is sensed when the beam is interrupted. Diffuse Scan (DS) type switches have both transmitter & receiver in the same enclosure. The closely focused beam is reflected back by the object. Retro-Reflective (RR)type switches use a special reflector to reflect back the beam. When an object interrupts the beam, an output signal is generated. These models have greater sensing distance compared to DS type. The receiver does not consider any reflections from other objects or sources. These switches are offered in tubular metallic, acrylic & plastic enclosures. Standard models are available with integrated 2-meter long cable. 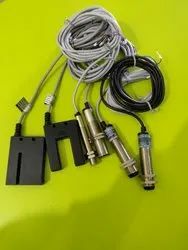 Switches with built-in (Male) connectors (International M8/M12 size) for quick connections are also available. It senses any object; Longer Sensing Distance; Medium counting speed; High position sensing accuracy. These are Infra-red type sensors incorporating advanced and reliable technology. These are offered in tubular metallic, acrylic & plastic enclosures. Special models of Optical Switches are available with an integrated Optical Fibre cable for flexible mounting and for sensing miniature objects / high-temperature objects. Available in M8 and above sizes, the optical proximity switches are a reliable solution for automation applications where higher sensing range is the requirement. These switches are available in three distinct types viz. Diffuse Scan, Retro-Reflective and Through Beam. Useful for Position sensing, Level sensing and counting applications in Robotics, Textiles,Automobiles, Foundries, Pharma, Food Processing, Packaging industries.